On March 11, SNU held an award ceremony for recipients of the Spring 2019 SNU President Fellowship (SPF). The SPF is awarded to faculty members of major universities in developing countries who wish to pursue their Ph.D degrees at SNU. The scholarship covers full tuition, a monthly stipend of KRW 1,500,000 for 4 years, round-trip airfare, Korean language training, and medical insurance. Priority is given to applicants with research experience in engineering, medicine, public health, agriculture, developmental studies, and Korean studies. Since its establishment in 2014, the Fellowship has awarded 46 promising scholars from 13 different countries. Eight of the Fellowship recipients have already received their Ph.D degrees. SPF is part of SNU’s efforts to fulfill its global social responsibility. 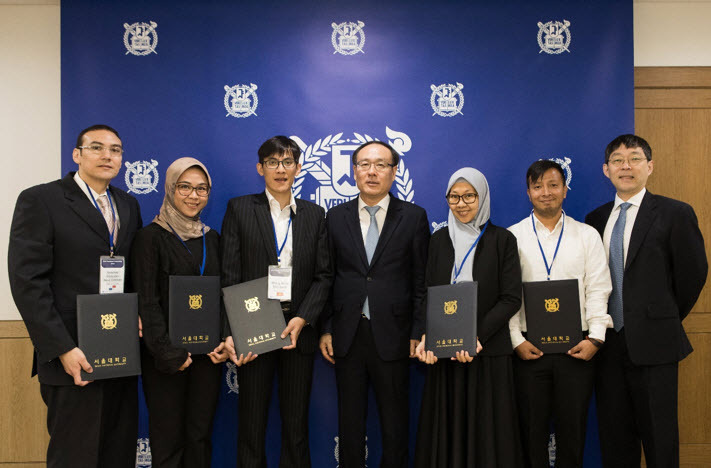 Recognizing that human capital has been the key driving force in Korea’s development, this fellowship aims to invest in promising minds elsewhere in the world. The Fellowship recipients for Spring 2019 include: Hoang Khoa Viet Bach (Graduate School of Environmental Studies Interdisciplinary Program in Landscape Architecture, Dalat University), Dewi Anggia Utami (Department of Education, Universitas Padjadjaran, Bandung), Pinanga Yangie Dwi Marga (College of Pharmacy, Institut Teknologi Bandung), Sanchez Gonzalez Rene Esteban (Department of Industrial Engineering, Universidad de Panamá), and Shakya Prabin Raj (School of Dentistry, Kathmandu University). This is the first semester that candidates from Panama and Indonesia have received this scholarship. “SNU President Fellowship is a very potent model to prove to the world that financial support [of] a deserving candidate could change the future of the student as well as [of] the country.” said Suchen Kumar Yadav (College of Medicine), a former recipient of the SNU President Fellowship.